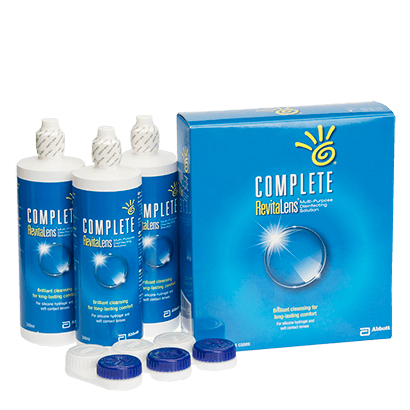 Complete RevitaLens Solution Triple Pack by AMO combines the functions of several different contact lens cleaning products. The all-in-one solution is ideal in terms of convenience, saving you the trouble of buying and using multiple products. Complete RevitaLens Solution works to clean, disinfect, rinse, re-wet and stores your soft contact lenses, such as silicone hydrogel lenses. You can also rely on the solution to effectively remove any deposits, or proteins that have built up on the lens surface, for a safe and healthy lens wearing experience. Contact lenses are conditioned by the multi-purpose solution, which means that the amount of time that you can wear the lenses is increased. This is as a result of effective disinfecting and deposit removal. Maintaining the quality and comfort of your eyes is easy, and you can save plenty of time on your cleaning routine with this Complete RevitaLens Solution Triple Pack. At FeelGoodContacts.ie, we also offer this product in a handy Flight Pack edition for added convenience. RevitaLens Solution is the best i have ever used for my soft contact lenses, it keeps my eye moist all day long. Would never use any other. Good value for money pack. Was having dryness problem. I Made lots of different, lenses feel much better. Good product and simple to use.